Rupert Murdoch handed over 21st Century Fox, the conglomerate behind Fox News, to sons James and Lachlan July 1, 2015. James is now CEO and Lachlan executive co-chairman. Last year Murdoch elevated his sons to prominent positions, James to co-COO and Lachlan to non-executive co-chairman, but the turnover of the conglomerate came sooner than expected. Ailes was not notified of the management change in advance. Apparently, Murdoch has been convinced that Fox News will continue do well without Ailes at the helm. Last year Ailes took a leave of absence due to an illness, and the network’s ratings didn’t slide. Now that control of Fox News has been given to Murdoch’s sons Ailes’ fair and balanced reporting and conservative punditry will soon fall by the wayside. “I think the boys are back … yoked together in a sort of competitive collaboration,” said David Folkenflik, author of Murdoch’s World: The Last of the Old Media Empires. Last month at the behest of Ailes, Fox News gave Trump more airtime than any other candidate, and analysts and hosts made pro-Trump arguments and gushed over him. But then the network jumped the shark at the Republican Party’s first presidential primary debate in Cleveland, Ohio, last Thursday. Murdoch’s message to blunt Trump’s rise in the polls came loud and clear over his social media and publishing outlets, and the Fox News debate moderators tried to destroy his candidacy in a single night by unleashing an all-out character assassination to discredit him. 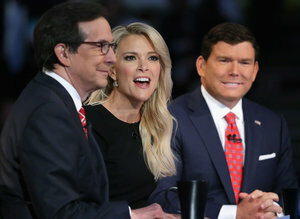 Throughout the night, Fox News moderators, Bret Baier, Chris Wallace, and Megyn Kelly, deluged Trump with cheap shots and sophomoric “gotcha” questions, while pitting the candidates and the audience against him. In spite of the moderators’ collective efforts to take care of “This Trump Thing,” Trump managed to survive their inquisition, but the network that Ailes had built over the past 15 years did not. Fox News died a humiliating death at Quicken Loans Arena August 6, 2015, in front of 24 million viewers. In display of solidarity with its leftist alphabet and cable network counterparts, the network relinquished any pretense of credibility. For more on the story, see Roger Ailes’s Demotion Signals Power Shift Within Murdoch Empire, THE FUTURE OF FOX: Murdoch’s sons taking over at 21st Century, and Rupert Murdoch Wants to Stop Donald Trump, But First He’s Got to Rein In Roger Ailes.